DownWithTyranny! : Obama Using Nike to Sell TPP; Does Nike Have Access to TPP Drafts? Obama Using Nike to Sell TPP; Does Nike Have Access to TPP Drafts? In this video, "Gap" is a proxy for the whole industry, including Nike. To learn about the problem with subcontractors, start watching at 10:30. Nike is ground zero for "made in Asia" shoe apparel. President Obama is ground zero for "let's send more jobs to Asia and claim the opposite." I'm not sure it benefits either to put the two together. Nevertheless, Obama will travel to Nike headquarters in Oregon to put the case to the nation that TPP is somehow good for American workers. President Barack Obama will travel to Nike Inc headquarters in Oregon next Friday [May 8] to argue that a 12-nation Pacific trade deal and the fast-track legislation needed to finalize the pact are good for workers. Obama faces tough opposition from his fellow Democrats in Congress over the Trans-Pacific Partnership (TPP) trade deal, which they fear could hurt American jobs and the environment. He will use the trip to the headquarters of Nike, a company once criticized for its use of "sweatshops," to "discuss how workers will benefit from progressive, high-standards trade agreements that would open up new markets and support high-quality jobs," the White House said in a statement. Nike was targeted by labor activists in the early 1990s for contracting with factories in Asia where workers faced dangerous conditions and low pay. The criticism prompted the company to create a code of conduct for contractors and open factories for inspections. When Nike was founded in 1964, just 4% of U.S. footwear was imported. Five decades later, that figure has skyrocketed to 98%, and Nike has likely played a role in driving it up. Now one of the world's biggest retailers of athletic shoes, Nike manufactures a vast majority of its footwear and apparel outside the U.S. The company's founder, Phil Knight, came up with the idea of outsourcing manufacturing jobs to cut costs while attending Stanford Business School in the early 1960s, according to the Wall Street Journal. The company now has 68 factories in the U.S., representing just 9% of its manufacturing facilities. Those U.S.-based factories employ just 1% of its total workforce, or 13,922 employees. Becoming an early adopter of outsourcing has helped propel Nike into one of the biggest athletic footwear and apparel companies in the world. Not only is Nike wildly successful; Phil Knight is wildly successful as well. Forbes has him as the richest person in Oregon, the 21st richest person in the U.S., and the 35th richest human on earth. His "real-time" net worth as of this writing, according to Forbes, is $23 billion. That's $23,000,000,000. Net worth. Nike [became] a symbol of abusive labor practices, after reports of unsafe conditions at many of its foreign factories began emerging in the 1990s. In a May 1998 speech, then-CEO Phil Knight was forced to admit that Nike had "become synonymous with slave wages, forced overtime, and arbitrary abuse." If you use global wage-power to pay people as little as 30 cents an hour to make something wildly popular you can sell for $100 each — and you have the kind of conscience that allows you to do that — it's not that hard to pocket that first billion. After that, the money just makes itself, especially if you can blackmail your home state as Knight has been doing to Oregon (read on for that). Nike Will Say They've Changed, But Do They Police Their Contractors? Nike has been saying they've seen the light, so to speak, and "established a new set of working standards, as well as a vigorous new auditing system to monitor labor practices in its factories and restore consumer faith in its brand" (Business Insider again). The company employs 56,500 worldwide, including retail workers, a 17 percent increase in the past year, according to the company's most recent annual report. 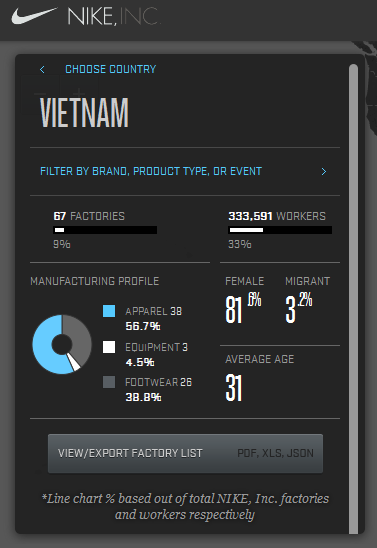 Yet if you go to the Nike Manufacturing interactive website, and use the controls to select Vietnam, for example, as the country of manufacture, you find 67 factories, 333,000 workers. And those are just the people it knows about, or claims to know about, in Vietnam. Does it know everyone to whom its work is subcontracted? Does it police its contractors' subcontractors? 1. Is Nike getting any poorer? Not likely. If you click through to that Portland Business Journal article, you can read about how Nike used the threat of leaving Oregon entirely to strong-arm state government ito giving it "tax certainty." In exchange for a commitment that it would create at least 500 jobs and spend at least $150 million on [Nike] campus expansion by the end of 2016, lawmakers agreed to give Nike "tax certainty," and continue taxing the company only on the sales of products in Oregon. A global company, one of the richest in its industry, pays state income taxes only on sales in Oregon, not its total income. All in exchange for 500 local jobs and the promise to upgrade the Nike campus. Not state infrastructure, say. Just its own corporate headquarters. Nice deal you "negotiated," Mr. Knight. 2. Does Nike have a seat at the TPP bargaining table? According to Public Citizen (pdf): "In the United States, approximately 600 corporate lobbyists have been named as official advisors [to TPP negotiations], granting them steady access to the negotiating texts, as well as the negotiators." Would Obama cut Mr. Knight, the king of moving manufacturing to Asia, out of TPP negotiations? I'd be shocked if he did. Do Nike's lobbyists or other representatives have access to TPP draft text? If so, why can't the American people see it before Fast Track is voted on? I'd love to see the answers. So would Elizabeth Warren, I'm sure.